Last month I set myself 37 books to read, I managed to complete 14 of them which include: Carrier of the Mark, On Chesil Beach, The Emerald Tablet, The Winter Ghosts, They Found Him Dead, Sweet Tooth, Maus I, Champions of Power: Age of Aura, Maus II, The Farm, The Pale Horse, Breakfast at Tiffany's, Heaven and The Carrie Diaries. As usual, reviews have either been posted for these books or will continue to be posted throughout the month of June. If there is a particular one you would like to see reviewed, then please let me know. 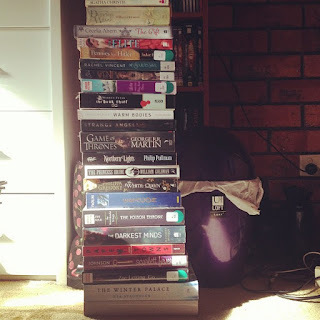 Like most bloggers, I have this insane problem where I buy way more books than I read and so my TBR pile is absolutely through the roof (at this point in time I've marked over 1,300 books as 'to-read' on Goodreads), so in the month of June the goal is to make a slight dent in that massive pile by only reading books that are already included in that list. I'm on holidays from school for half this month so I hope to speed through these books then.